Pasta is an Italian recipe and is very easy to make. It can be had as a snack or as a meal. 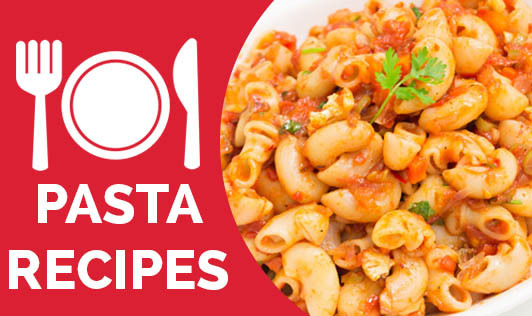 Here are some simple and quick pasta recipes that you can whip up in no time. • Cook pasta in boiling water with a little salt. Strain and keep aside. • Cook broccoli in boiling water for 5 minutes. Keep aside. • Grind tomato, onion, garlic, salt and red chillies to a paste. • In a big non-stick pan, add oil and the ground paste. Sauté for sometime till the raw smell of garlic is gone. • Add mushrooms and broccoli. Mix till the mushrooms are cooked. • Turn off the heat and add cooked pasta and olives. • Mix well and serve hot. • Cook pumpkin, onion and garlic in a pressure cooker and grind it to make a smooth paste. • Boil peas and carrot till soft. • Cook pasta in boiling water with little salt. Strain the pasta once cooked. • In a pan, heat oil, add the ground paste and cooked vegetables. Wait till it just starts boiling. • Add salt, white pepper, thyme and olives. • Add the cooked pasta and mix well. • In a pressure cooker, cook spinach, potato, onion, garlic and green chillies. Once cooked, allow it to cool. • Grind the cooked vegetables to a fine paste. • In a pan, add oil, ground paste and cooked pasta. Keep it on the flame for 5 minutes with occasional stirring. Turn off heat. Note: you can add desired vegetables too all the recipes.